This post is the second in a trilogy of blogs based on quotes. It seems strange to me that Curtis’ words can ring so true and be so hard to stick to. Perhaps it’s not this way for everyone. In my current recording project, I’ve certainly found creativity and ego (with or without the suicide) to be intertwined in ways that I’d rather they were not. I’m finally recording my songs. I’ve considered myself a singer-songwriter for many years, but never took the time to record them in the studio. Life changes prompted me to make these recordings a reality and so the project began last year. The voice is such a personal instrument. No matter how many times I practice or take the songs to my vocal coach, the preparation always seems insufficient to remove the vulnerability that I feel when I get in front of the microphone and deliver the lyrics on pitched tones. It’s also true that the recording of these songs tells my life story not only in the lyrics themselves, but also in the memories and the feelings they carry from my personal history. For these reasons alone, the completion of this project has become a pure passion on my part. Doing creative projects can bring up vulnerability. There is more than this that makes singing vulnerable for me. I’ve worked at this craft of making my voice one of my instruments for decades. It’s been rare during my adult life that I been told I have a beautiful or wonderful voice. However much I don’t want my art or self-worth to be based on the praise of others, I cannot shake the sense that the feelings I convey with my mouth, tongue, and vocal cords should be somehow more worthy than perhaps they are. My voice teacher — who is very attuned to personal introspection and consciousness — said this when I told her about the trepidation that singing brings up for me: “Of course it does.” In other words, she told me, many singers share this sense of vulnerability. It’s natural to connect so powerfully between personal story and one’s voice. They are connected. While this is reassuring, it also comes with a danger and therefore a caution. The danger is to completely identify myself with my voice and to couple this with whatever external judgements I sense or hear. Meaning that if someone does not “like” my voice, they therefore dislike all of me and my story. Obviously, this may not be true. The real trick is to care and not to care about the judgements of others. I cannot predict or control what other people think, so giving their responses power over me renders me powerless: “ego suicide”. Personally, I have not perfected this balance of caring/not-caring, but I am finding ways to cope. This project is teaching me so much and I pray that I will take its lessons to heart. 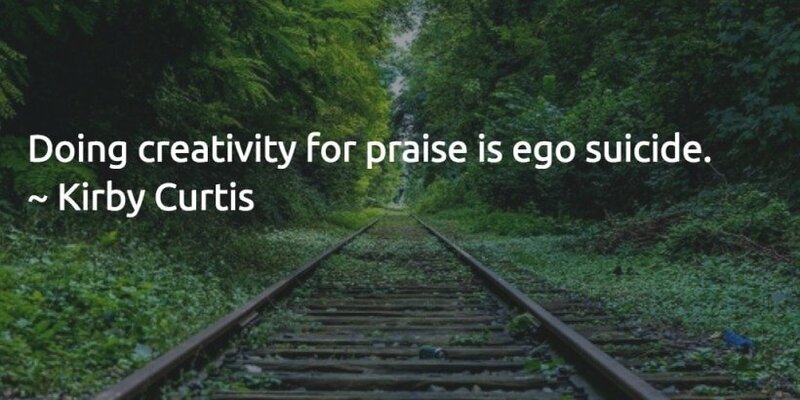 Have you experienced the intersection of creativity and ego? In other words, has your self-worth ever been impacted by the results of something you created?